OK, so my first Whale Shark encounter last month left something to be desired, as my timing was off, my equipment wasn’t cooperating, or the boat went in the opposite direction than I expected, and I didn’t get around it in time to catch the whale sharks before they took off. Plus, the Whale Sharks on my first boat trip out here didn’t cooperate, choosing to dive down to way beyond my snorkeling capabilities would allow me to follow. This last time was totally different. 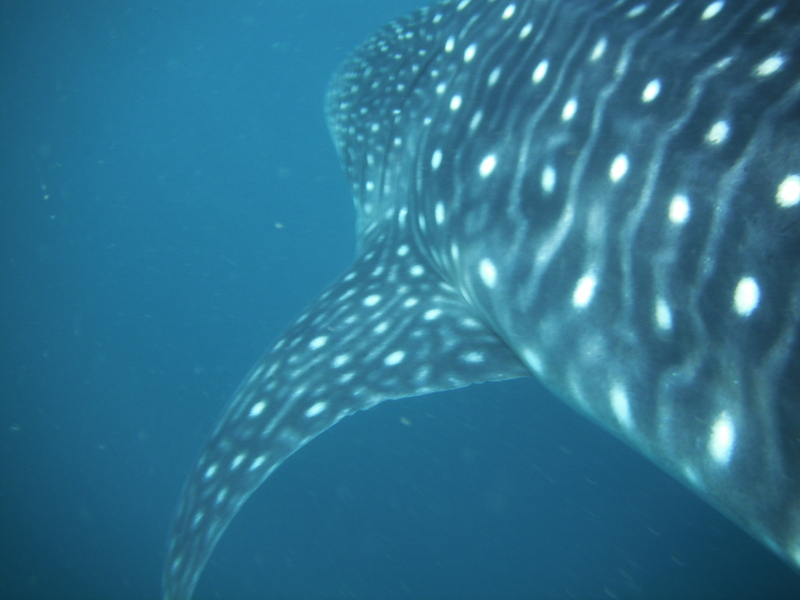 And I came prepared with a digital underwater camera to snap some cool pics and videos – so in this post, the pictures are 100% mine, not borrowed from some other, more successful and better prepared whale shark-stalker! 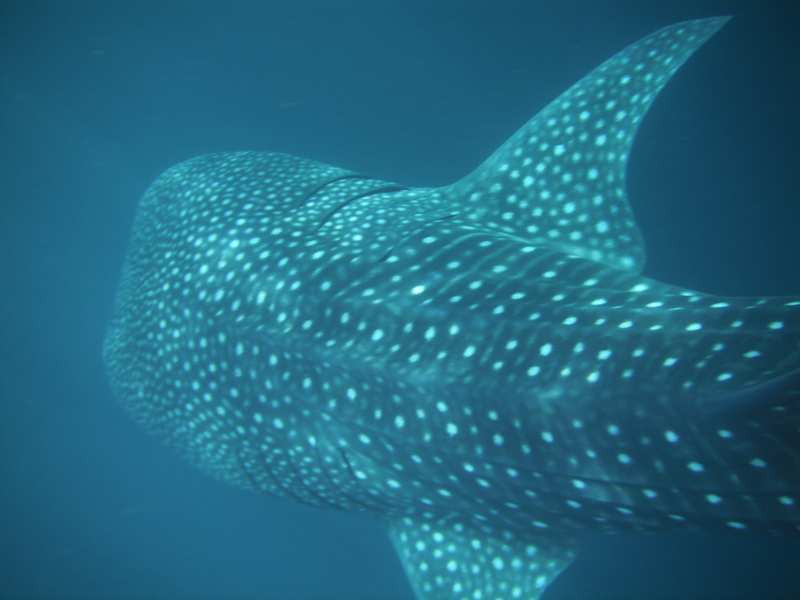 Now, for an education about this species of filter-feeding shark, go to wikipedia at: http://en.wikipedia.org/wiki/Whale_shark. For a description of what it’s like to swim with them and be around them, keep reading. Even having seen whale sharks from the boat the last time I went out on a whale shark trip, I really didn’t get a feel for how HUGE these animals are until I was in the water right next to one. My experience this time was totally opposite my last trip. The last time, I was swimming around in poor visibility, not seeing anything and getting frustrated. Plus, I had flippers that weren’t comfortable on my feet, and a snorkel that didn’t attach to my mask, so I hated using them all. This time, I was properly equipped and immediately after I jumped in (after I avoided getting hit by the boat), I immediately ran right into a whale shark right in front of me. And I had comfortable flippers on, so I was able to stay along side him for quite some time. The water was clearer, as the day was less overcast, and the whale sharks didn’t avoid us by diving down into the deep waters, but rather they stuck around near the surface and let us swim with them. They hardly paid us any mind at all, and I found myself so close that I was afraid the Whale Shark might accidentally (or intentionally, though they didn’t seem that malicious) whack me with his tail while turning or something. 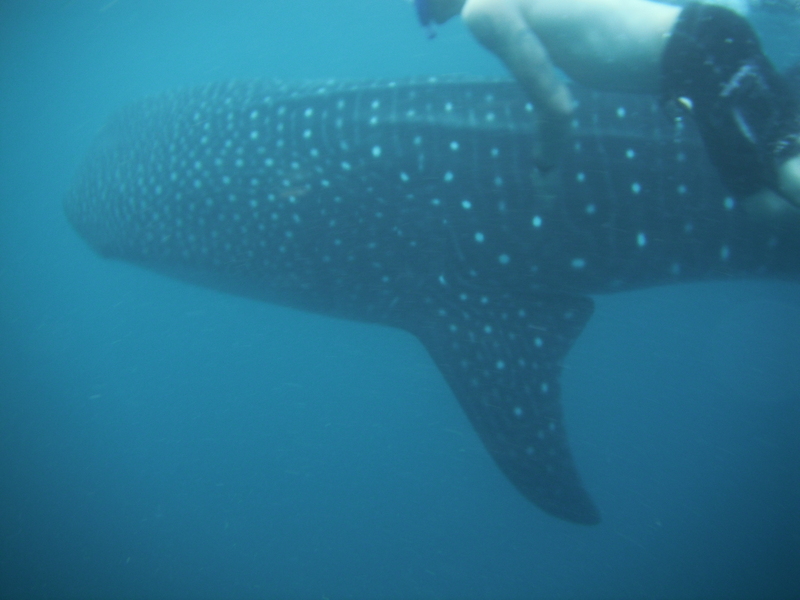 We’d been asked not to touch the whale sharks, but I was afraid the whale shark was going to touch me!! 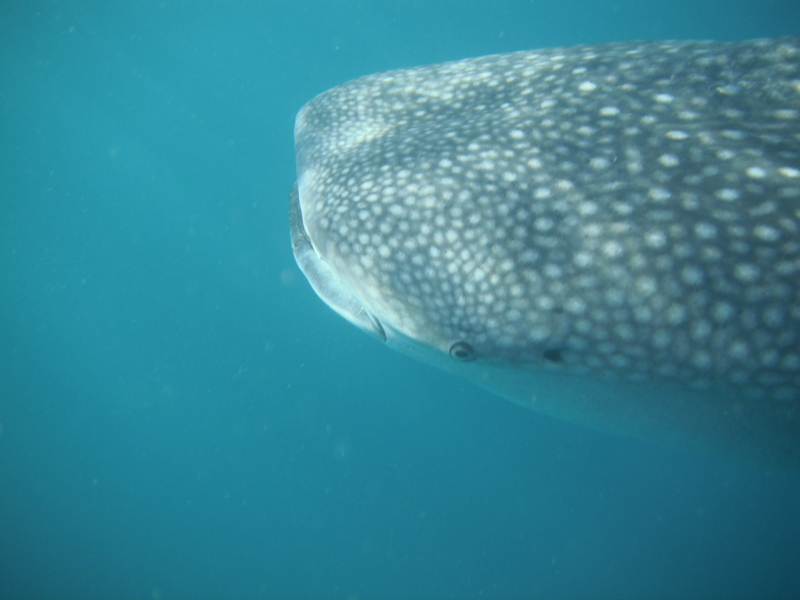 Face to face with a whale shark, right off the boat! These fish have huge mouths, as they feed using the filter method – just letting whatever is in the water sort of get strained through their mouths. They just kind of swim around, looking a little surprised, with their mouths hanging open. Their eyes are not far from their gaping mouths, and relatively small for their size. They clearly checked me out as I swam along side them, but they didn’t really pay me too much attention, just continuing on about their daily life. I don’t know if they regarded me too differently from some of the small species of fish that swim near them, recognizing that bigger predators will stay away from the Whale Sharks, so sticking close to them is a pretty safe place for a smaller fish to be. They kind of looked at me then kept going along their way, glancing sidelong at me from time to time as I tried to keep up, filming videos and snapping pictures along the way. What a weird-looking fish I must have seemed like to them! One thing that I thought was pretty cool was how huge their gills were, and how I could get close enough to really check’em out! Now, here’s my question: why would I possibly fixate on that?? Look how big this whole fish is, and I was fixating on the gills? I think I was missing the forest for the trees!! These gentle giants had to be well over 15 feet long – probably closer to 20. And I’m told that makes them far from the biggest whale sharks out there, as the largest confirmed one found was over 40 feet….. so these guys are only 1/2 the size of the biggest ones around!! I can’t even get a grip on how big these one are and they’re not even close to being the biggest!! All I have to say to that is WOW!! 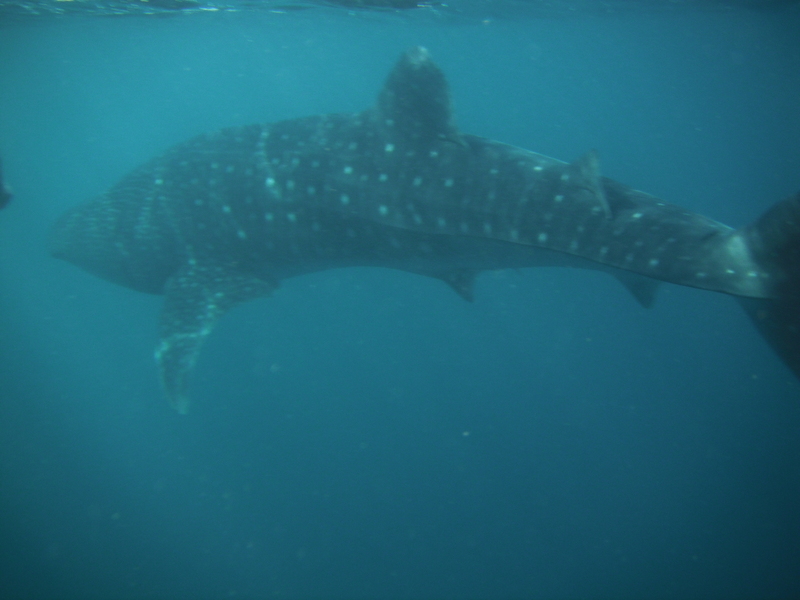 This trip was a huge success, as it seemed like this time we couldn’t get away from the whale sharks! One time I would jump out, and there was one right below me. The next, a little ways in front of me. There were even times when we could choose which side of the boat to jump out of as there were whale sharks on either side! It really was incredible. All I can tell you is this: if you ever get a chance to swim with these gentle giants, take it! I’d say it was indescribable, if I hadn’t just gone on for 800+ words trying to describe it! 🙂 Then again, I don’t think I did the experience justice, so perhaps it really is just that: indescribable. Yes, you really do get this close. No, this isn't super-zoomed in. Yep, he's RIGHT THERE! ← Merry Christmas, Happy Holidays, and May You Have a Travel-Filled New Year! These are great! Your pretty brave there girl!